This recipe came about because I didn’t just want to do a ‘plain’ (i.e. delicious) chocolate cupcake and I love cardamon and cinnamon with chocolate and chocolate and pear is always delicious, so I thought I’d play around with the idea. The ganache was inspired by a similar (much fancier) version that Chef Sarah Grueneberg made in Season 9 of Top Chef (recipe is here.) The idea of a more caramel version of white chocolate totally got to me and I messed around with it as an accompaniment to this cupcake. Personally, I’m a less is more person on the icing stakes so, in future, I’d probably halve the amount of icing. Kerry and Dan were worried about the amount of liquid in this recipe — particularly as I was also adding a watery fruit to it — but that issue never occurred to me until they were standing in front of me, asking me about it and there were a bunch of cameras. And, having made them again yesterday, I can see the concern when you are at the start of the recipe but I promise it all works out well. This makes 24-ish cupcakes depending on your case size etc. Preheat oven to 170C. Line muffin tray. Sift flour, bicarb, baking powder and salt. In a separate bowl, whisk together coffee, hot water, cinnamon, cardamon and cocoa to smooth paste. Add cold water and whisk until evenly combined. Cream butter for 1-2 minutes. Add the caster sugar a third at a time, beating for 2 minutes after each addition. After the last addition, beat until light and fluffy and sugar has mostly dissolved. Add eggs one at a time, beating for 1 minute after each one. Add vanilla and beat until combined. 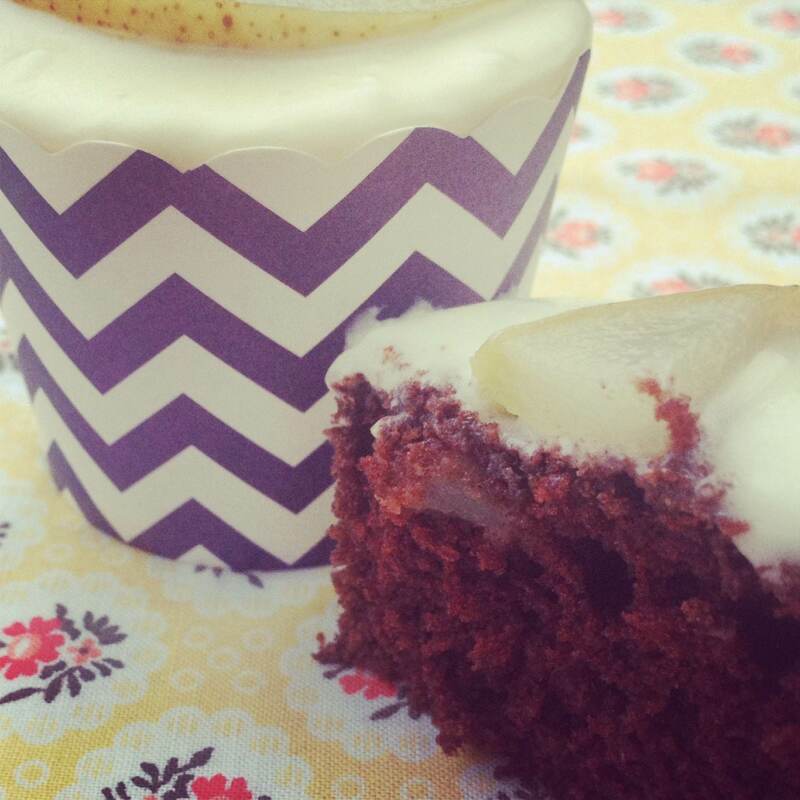 Spoon into cupcake papers, filling each to ½ – ¾ full. Allow mixture to sit for 10 minutes before baking. Remove from tray immediately and cool on wire rack to cool completely. Warm cream in small saucepan. 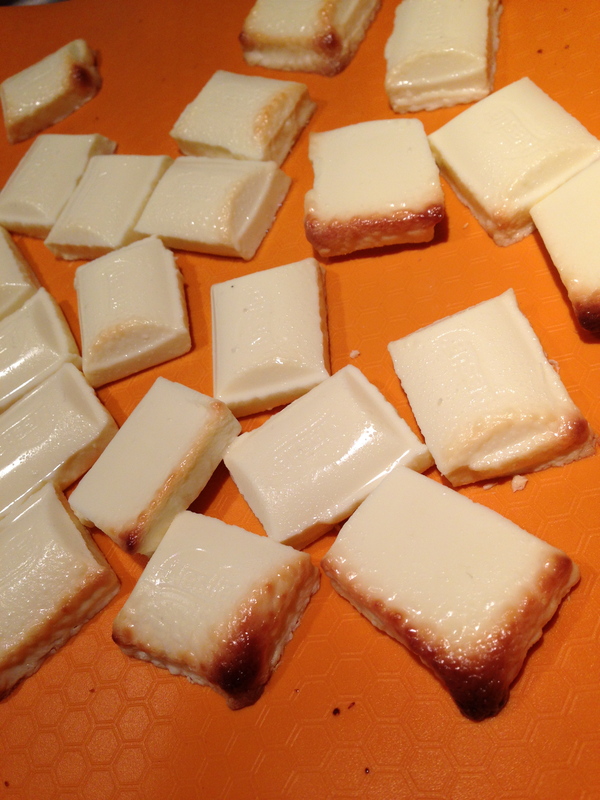 Break white chocolate up on silicone baking sheet and roast in 150C oven for 10-15 minutes. WATCH IT LIKE A HAWK OMG. It will go from nicely roasted to NO NO NO BURNT very quickly. Put chocolate in medium mixing bowl and pour cream over. Using handheld mixers, beat in icing sugar. The amount of icing sugar really depends on what consistency of icing you want and how long you can leave it to set up. I know that is a bit wishy-washy but trust your instincts! Once the cakes are actually properly cool, spoon on the ganache and smooth to edges. 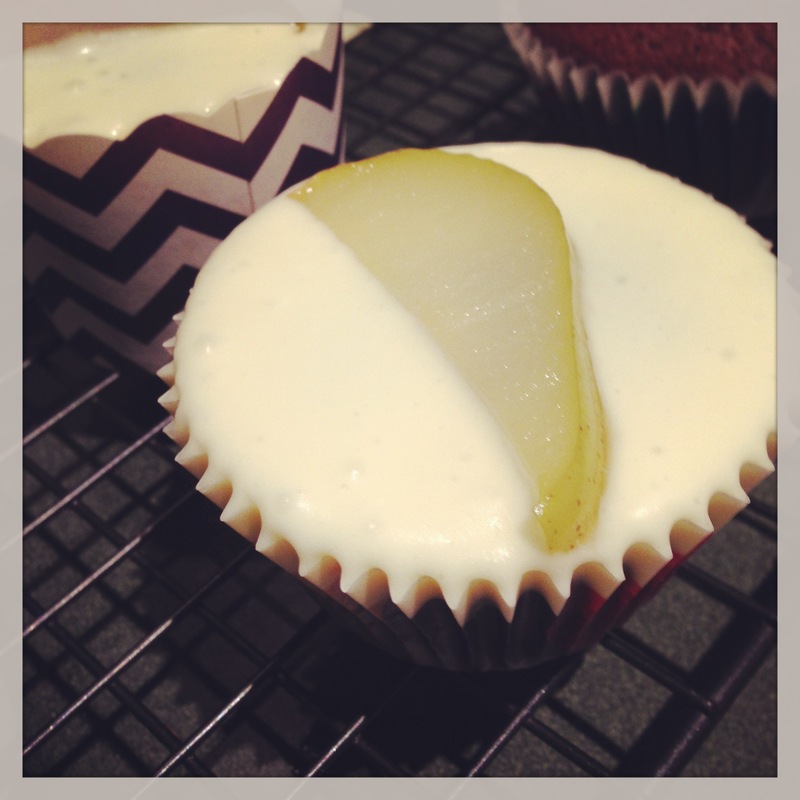 On the show, I candied a piece of pear and put it on top and with this lot, I poached a piece pear. I think the poached it better but you do your thing! I hope you enjoy these — I really do love the flavours. Next time, I might also add some ginger into the mix. Did you watch Bake Off? What did you think? Congratulations to Maria for getting the inaugural Star Baker – that woman is super focussed and talented! Commiserations to Steve who is such a champion and was a pleasure to share the back half of the tent with. Is it weird that I tear up every time I watch your little intro thing with Essie, Artie and the Porkos? I thought Bake Off was great – I love Shane Jacobsen (in all his cornball greatness) and Dan Lepard seems like an absolute hunny. I’m looking forward to this week’s ep, and of course, your face!! Thanks, Jen! There is a book already — out before the show! — and some excellent recipes in it. You can roast white chocolate at home?! That’s brilliant. I was once served such a thing at a fancy-schmancy restaurant and I loved its nuttiness.